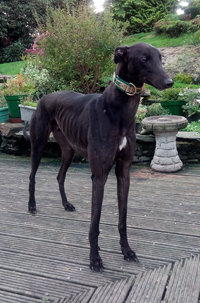 Sid is a tall black ex-racing greyhound who was born on the 24th September 2013. He is house trained, neutered, inoculated and microchipped. Sid is a very loving lad who likes othing more than being with you and having lots of cuddles. 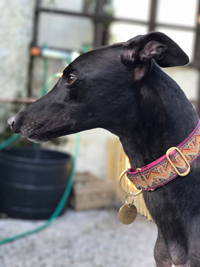 He walks niclely on the lead but can be a little wary of new environments until he gets to know them and he travels well in a car. 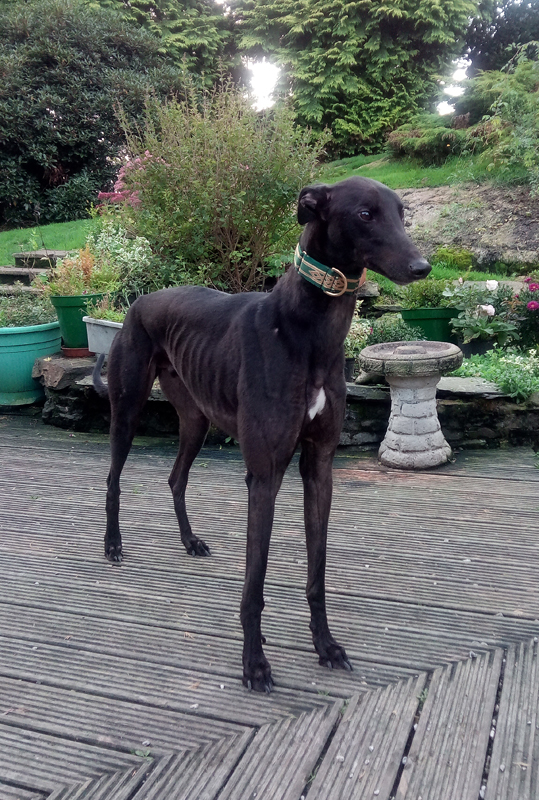 This evening we received an email from Sid's new owner saying: "So far, so good! Sid travelled home with no problems, checked the house out, had two big wees in the garden. He was a bit freaked out when he was in the garden and the next door neighbour put some ladders up at the back of the house, then again when he saw a cat on the wall. He's had a nice walk, we stopped to talk to a lady with a shitzu, I kept him beside me but there was no lunging or barking, good lad! He's had his tea with chicken and gravy and loved it, then another wee in the garden. Flat out now after a play with his squeaky monkey. He's Brill". We received a card today from Sid's owners thanking us for matching them up to him. They said "He is such a lovely dog - clever, gentle and funny. He has filled a huge hound shaped hole in our hearts left by Tina when she died." We are so pleased he is settled especially with him having such an unsettling start when he first arrived with us.